The annual Milan Design Week (Salone del Mobile) in April is undeniably the event of the year. Although it was a place where we first launched Parachilna back in 2014, we are not a fan of Milan Design Week and all kind of shows like this (we have already said that before). Milan is a fantastic city but during this event it becomes impossible even to walk the streets or to be properly served in restaurants. The mass of people creates an unimaginable chaos everywhere mostly in Salone itself whose enormous dimensions does not make it easier. 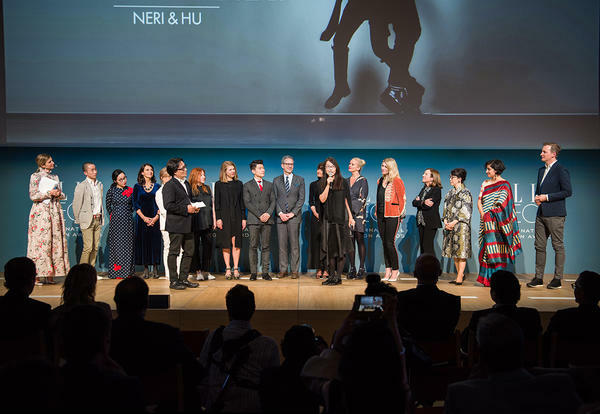 The biggest highlight was the ELLE DECO International Design Awards (EDIDA) ceremony, where we were pleased to see Neri&Hu Design and Research Office take home the Designers of the Year award. It was a well-deserved win for Shanghai-based creatives Lyndon Neri and Rossana Hu. For over a decade, the partners have focused their energies on projects that blend function and innovation. They deserved it also because their the most victorious ability is their humanity. We rarely meet in our lives , even in our private circles such a nice, honest, humble, caring and smiling people. It is a pity that there is no award for the truest and the best person of the year because if there was one they would be the winners! Neri&Hu’s speciality is giving old-fashioned spaces and concepts a modern yet minimalistic revamp. For example, the design of their Bai lights for Parachilna was based on the traditional Chinese lantern. In the update, paper was replaced with blown glass, wire was traded for high-quality metalwork finished in aged bronze and candlelight was swapped for an LED. They even incorporated their heritage into the name of the collection, Bai, which is a common surname in China. The end result: a family of hanging lamps consisting of a mother, father and a son – a clever reflection of China’s one-child policy. The two architects have been on a winning streak in recent years. They were named Maison&Objet Asia Designers of The Year 2015 and Wallpaper* Designer of The Year 2014. In 2013, they were inducted into the U.S. Interior Design Hall of Fame. With Jaime Hayón winning ELLE DECO’s Designer of the Year Award in 2016, we’re happy to see two more of our collaborators receive the accolade. The ceremony was marked with excitement, along with a touching acceptance speech from the duo to cap off the evening.